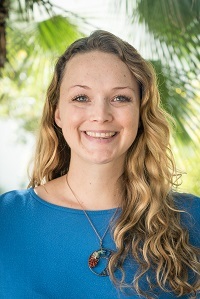 After receiving a Bachelor’s Degree in Child and Family Development, Alexis spent eight years working with children and families in a variety of roles. After applying to SDSU’s MSW program she was placed at Serving Seniors for her first year internship and fell in love with the senior population. At Serving Seniors, Alexis had the opportunity to complete Comprehensive Geriatric Assessments with individuals interested in the new dental program offered through the West Senior Dental Center. Now in her second year, and a recipient of HRSA GWEP Alzheimer’s MSW Stipend, Alexis is currently interning with Union of Pan Asian Communities (UPAC) and assisting with the Geriatric Specialty Program. Here, she is able to investigate reports of elder neglect and ensure that the senior is connected to any needed resources via short-term case management. Alexis is thrilled with her new internship and looks forward to ensuring clients are safe, thriving and living their best life possible.